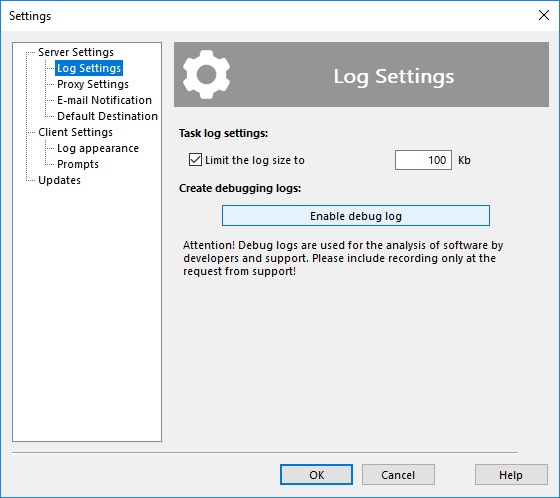 Short logs are available in the Log View pane of the main window. They contain brief information on time, size and status of a task. Detailed logs contain complete information about each file backed up. Link to detailed log is available in the beginning of a short log. Each time you run a task, the program checks size of detailed log, and if it is large enough, deletes it. Log Settings are used to specify maximum size of the log. Check Limit the log size to if you want to save disk space by automatically deleting unnecessary logs. Specify the limit in the field to the right. Note: The program deletes old logs in the beginning of the task, so the latest log always comes without any limitations.